2 What is Strep Rash? A strep rash, which is also known as scarlatina, usually occurs when a strep throat condition develops or is present. Strep throat is an infection of the throat caused by Streptococcus bacteria. When a person has this strep throat problem the typical symptoms are: a high fever (around 39.5 degrees Celsius or 103 degrees Fahrenheit), frequent chills, headaches, a throat that is very sore, irritated, and red – making swallowing and eating or drinking difficult, enlarged tonsils (if present) that may be covered in white, grey, or yellow spots or coatings, and swollen glands or lymph nodes in the neck area. Strep rash is a type of skin rash that is associated with strep throat and scarlet fever. 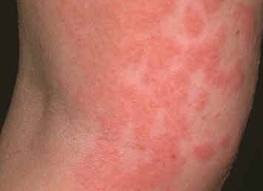 Occurrence of strep rash is rare in case of strep throat, but is commonly found in scarlet fever. It has been observed that, in most cases scarlet fever is caused by strep throat. Both strep throat and scarlet fever are caused by group A streptococcus (strep) bacteria, but, scarlet fever is often caused as a complication of strep throat. 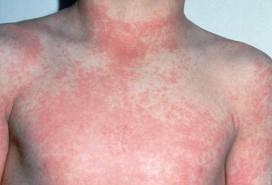 Strep rash is one of the most common symptoms of scarlet fever and the name scarlet fever is derived from this scarlet-colored rash. Some strep skin infections, like, cellulitis, can also cause this rash. Read on for some detailed information about itchy strep rash. As mentioned above, strep rash is a symptom of scarlet fever and in some rare instances, it may develop in people with strep throat too. Strep throat is caused by group A streptococcus (strep) bacteria and the common symptoms of this condition are chills, headaches, redness, irritation and pain in the throat, enlarged tonsils, strep throat rash, etc. The person may also have swollen lymph nodes in neck. Strep throat may develop into scarlet fever in some people and this condition is evidenced by the development of strep rash. This happens after 24 to 48 hours of the occurrence of strep throat symptoms. By this time, the bacteria releases toxins into the body and these toxins result in allergic skin reactions, like, strep rash. 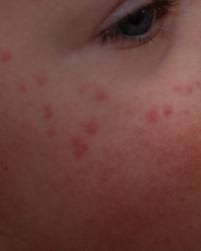 This rash can be distinguished from other types of rash with the help of other scarlet fever symptoms, like, fever, chills, headache, nausea or vomiting, flushed face with paleness around the mouth, etc. 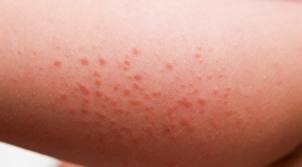 Strep rash also known as scarlatina or scarlet fever is one of the more common types of skin rashes. And it usually occurs during a bout of strep throat. 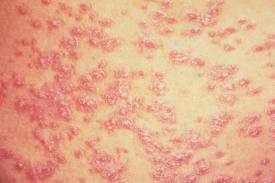 Looking at pictures of skin rashes, you’ll see that many look similar which is why getting a diagnosis is difficult. 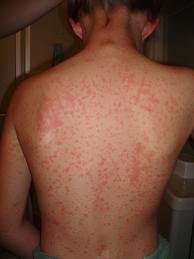 That is why its best to see your physician to get a skin rash diagnosis. According to the American Dermatology Association a strep rash usually appears about 12 and 48 hours after strep throat manifests. Some symptoms of strep throat include a headache, sore throat, high fever, swollen glands and infected tonsils. A strep rash looks like a bad sunburn with little red bumps. 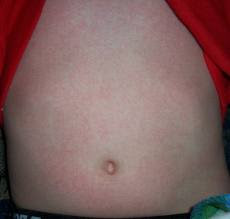 These bumps can start on the chest and then develop into a groin rash, underarm rash, and into a rash on the legs. It can also develop into a sweaty rash and be very itchy. When the skin is pressed, the area of the rash turns white which is why some people may mistake it for sunburn. A strep rash may last about 7-10 days, but the skin itching and peeling may persist for weeks. Strep rashes are most common in children and young teens 5-15 years of age. Antibiotics are the most common course of treatment and may clear the strep throat and rash, but the itching might still persist. Note that strep rash can also develop when someone gets a strep skin infection. If this is the case, its necessary to get immediate professional care. While a strep rash is not contagious, the strep infection is very contagious. You can protect yourself against this by keeping your hands clean, especially during flu season. Also, avoid contact with others until you have been taking antibiotics for a least a full day. You can also arm yourself with an herbal tonic that helps boost your immune system and keeps the skin healthy. Strep Rash – What is Strep Rash in Kids? If you have kids that are prone to sore throats you will probably know what Strep Throat is but do you know what Strep Rash is? You do not hear the term Strep Rash in kids very often but the more commonly used term you have probably heard is Scarlet Fever. Strep Rash (or Scarlet Fever) is actually a very common ‘side effect’ of Strep Throat that is sometimes mistaken for other illnesses. So let’s talk about Strep Rash and what you can do to determine if your child has it and what you can do to help relieve the symptoms. First off, you will notice the common word “Strep” in Strep Throat and Strep Rash. That’s because both are directly related to the Streptococcus Bacterium which is often found in the throat and on the skin of affected children. Strep bacteria can cause many infections in kids from sore throats to skin infections and sometimes very serious diseases. When we talk about Strep Rash, this is actually the skin rash that can develop in those with Strep Throat and the symptoms that accompany the rash can be very uncomfortable to young children. Not all children who develop Strep Throat will come down with Strep Rash. But, because they both originate from the streptococcus bacterium, parents need to keep an eye out for any skin rash that occurs during the illness. We’ve included some pictures below of Strep Rash and as you’ll notice it is easy to see how it could be mistaken for other illnesses.